Assistant Professor in Humanities - 1 Post for MBC - Basic Pay 15600 Academic Grade Pay 6000 in Pay Band III category - Master's Degree (Post Graduate) in concern subject with CSIR NET / UGC NET / SET / SLET or PhD. Good Academic Record is essential - Age 57 years. 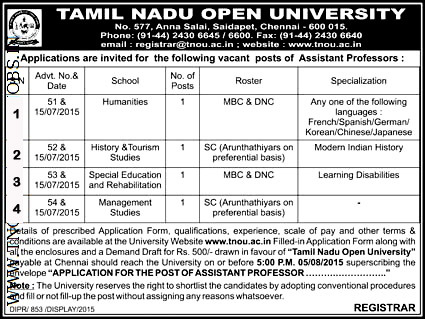 Assistant Professor in History and Tourism Studies - 1 Post for SC Arunthathiyar - Basic Pay 15600 Academic Grade Pay 6000 in Pay Band III category - Master's Degree (Post Graduate) in concern subject with CSIR NET / UGC NET / SET / SLET or PhD. Good Academic Record is essential - Age 57 years. Assistant Professor in Special Education and Rehabilitation - 1 Post for MBC - Basic Pay 15600 Academic Grade Pay 6000 in Pay Band III category - Master's Degree (Post Graduate) in concern subject with CSIR NET / UGC NET / SET / SLET or PhD. Good Academic Record is essential - Age 57 years. Assistant Professor in Management Studies - 1 Post for SC Arunthathiyar - Basic Pay 15600 Academic Grade Pay 6000 in Pay Band III category - Master's Degree (Post Graduate) in concern subject with CSIR NET / UGC NET / SET / SLET or PhD. Good Academic Record is essential - Age 57 years.